This date in 1896 during the Second Matabele War saw the execution by field court-martial of the rebellious Chief Uwini. This war, in present-day Zimbabwe, featured a revolt of the Matabele (Ndebele) people against Cecil Rhodes’s* British South African Company. In the field, it was a short-lived affair. Ndebele rebels slew over 200 white settlers in Matabeleland and Mashonaland during the first week of the surprising rising in March 1896. 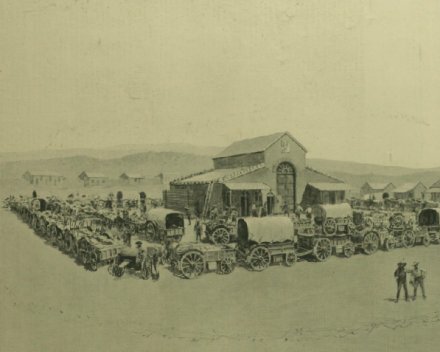 But most settlers were able to hunker down in he town of Bulawayo behind makeshift breastworks. Up to 15,000 Ndebele warriors menaced this little citadel, but were deterred from storming it by the settlers’ modern weapons — artillery and the legendary Maxim gun** — until relieved in May. (Rhodes himself led one of the relief columns.) At that point, the rebels retreated to their strongholds, fragmented from one another, and generally got picked off or bought off group by group over the ensuing months. One of the men arriving with Rhodes’s relief column was Robert Baden-Powell, an army scout who will bring us to this date’s feature execution. Baden-Powell was dispatched with a squadron of cavalry to pacify the area northeast of Bulwayo. When he arrived there, one of the main rebel chiefs in the Somabula Forest, Chief Uwini, had just been taken prisoner. This prisoner put Baden-Powell in a conundrum. He had written orders to turn prisoners over to the Native Commission for civil handling (whether trial or otherwise). Uwini had been induced to surrender by another officer’s promise to spare his life. However, this wounded chief could not be escorted five days back to Bulawayo by a force large enough to protect against the likely rescue attempt by his followers without abandoning his mission. Neither could Uwini be brought along on the patrol. Baden-Powell decided it would be the safe-conduct promise. Another letter dated later that same day confirmed that the expected sentence had indeed been rendered, and Uwini had been ceremoniously shot that evening at sunset before the walls of the enemy fortress, in the presence of as many witnesses as Baden-Powell could find. This quasi-juridical field execution put Baden-Powell in front of a court of inquiry after the fact. The court exonerated him, citing the circumstances and the purported effect of the execution in cowing the local insurgents. Despite leaving the court of inquiry “without a stain on my character,” in Baden-Powell’s own words, this incident can’t help but throw a morally questionable shade for later observers. And this agent of empire does have later observers — because Lord Baden-Powell (as he eventually became styled) would go on to found the Scout Movement.† His 1907 boys scouting camp and subsequent book laid the foundation for the ensuing decades’ Anglo scouting tradition. And this very Matabele War contributed crucial parts of the scouting backstory. It was in the course of this campaign that Baden-Powell became acquainted with the American scout and adventurer Frederick Russell Burnham. The two struck up a lifelong friendship, and Baden-Powell cribbed notes from the ranger’s guile (like wood “scoutcraft”) his counterpart had picked up on the dwindling American frontier. It was also in Rhodesia that Baden-Powell first wore the Stetson hat and neckerchief combination that would become a distinctive look both for Baden-Powell himself, and for the scout movement he launched. * As of this story’s setting, the place in question had just begun to be called Rhodesia. ** It is in the context of Great Britain’s colonial adventures in Africa in this period (though not specifically just those of Matabeleland) that Hilaire Belloc published his 1898 poem “The Modern Traveller”. In it, a character named “Blood” gave this early machine gun its definitive literary tribute: it’s the couplet highlighted below, but the larger excerpt may be illuminating. Blood understood the Native mind. Preserved us all from death. The rest became devoted men. To all the native races. † Baden-Powell also counseled scouts to be unflinching should the “duty” arise to hang a man.